There was little change in the breakdown from last year – just a 1 percentage point difference up or down in all categories except for parent income and savings, which fell by six percentage points, and student loans, which rose by six percentage points. Neither saving less nor borrowing more is good news, and they are related. 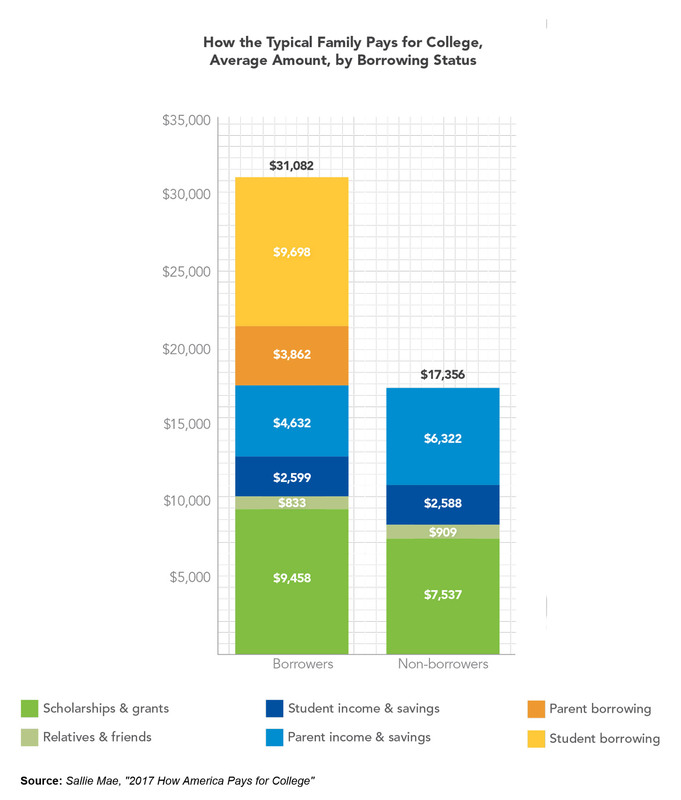 “When parent income and savings are less available, the funding gap appears to be bridged by borrowing, more student borrowing than parent borrowing,” according to the study, which is based on telephone interviews with 800 parents of undergraduates, ages 18 to 24, and 800 undergraduate students, ages 18 to 24, conducted by Ipsos Public Affairs. Forty-two percent of families surveyed borrowed money to help pay for college this year, according to the report. The typical loan amount was just over $9,600 for students and almost $3,900 for parents, and federals loans were the most popular for both. Borrowers were more likely than non-borrowers to attend college full-time and in a four-year program, and more likely to venture out of state, attend a private school and choose one based on its academic program. The study also found a disconnect between parents and children concerning loan repayment. 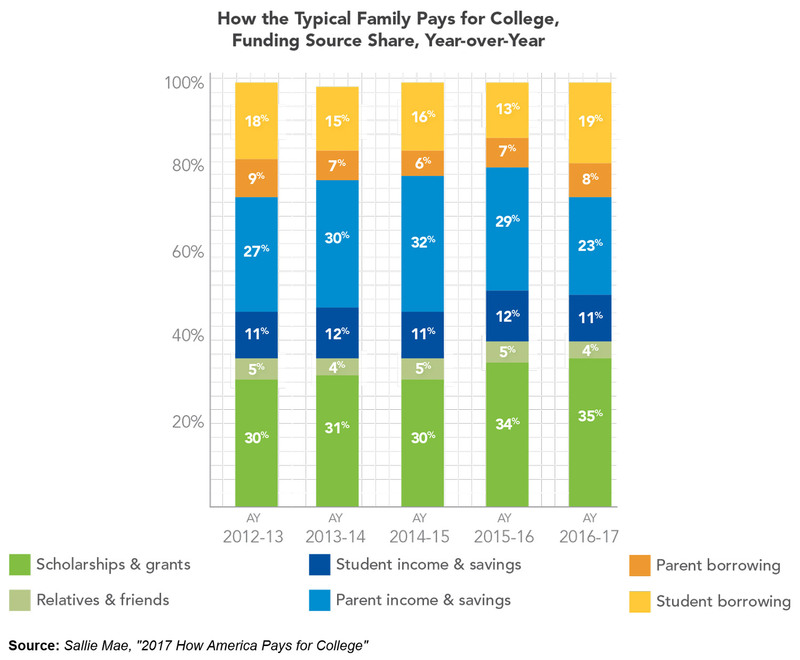 Despite the decline in savings and increase in borrowing, families and students are focused on college affordability, according to the report. Not only are they seeking scholarships – 7 in 10 families did but only 49% reporting using them – but most are completing the Free Application for Student Aid (FAFSA) (86%) needed to qualify for student aid, and 73% report choosing an in-state schools. In addition, 50% of students were living at home in the 2016-2017 academic year, 26% were enrolled in an accelerated program to graduate early (and spend less), 76% were working to help pay for college – working year-round or during school breaks—and 26% were enrolled in accelerated programs to graduate earlier (and save money). Many families were also reducing personal spending and working longer hours to help pay for college. One action many families aren’t undertaking, however, is developing a plan to pay for college. Even though nine in 10 surveyed said they anticipated college attendance since their child was in pre-school, less than half (42%) said they made a plan to pay for it. The survey covered families across the U.S. and found that those in the Northeast stood out from families in other regions of the country. Families in the Northeast spend about 70% more on college, and finance that with more borrowing and a larger contribution from parents. Enrollment in private school and on a full-time basis higher among those families as is academic programs as a key reason for college choice. Want more information? Ready to get on the right path to success?